Today I made Pani Puri for evening snack. My Dad and Mom loved it. Me too. I have made many other dishes too, but I loved this one. So, I wanted to share this recipe with all of my friends. 1. Mix all the ingredients in a large bowl. 2. Knead it to stiff dough. Cover the dough for 10 – 15 minutes. 3. Roll out the dough. 4. Cut out as many puris as you can from the rolled out chappathi using a round steel glass or a biscuit cutter. 5. Then take a Kadai. Pour oil into it . 7. Take one puri at a time and fry it till it comes puffing up like a ball. And fry it till it becomes golden brown. 8. Take out the puris with the help of an adult. Always have an adult near you when you do all this. 9. Serve it into a plate with a tissue paper in it, so that when you eat it there won’t be any problem of oils. 1. Add the coriander leaves, mint leaves and the green chillies to a blender or mixie. 2. Blend it to a nice, soft paste. 3. Add the paste to the water. 4. Add all the other ingredients. Squeeze the lemon. Add some soaked chicpeas if you want. Mix well. 1.Take a large bowl and mix all the ingredients. 2. If you want you can squeeze the other half of the lemon we used in the pani. 1. Take one puri at a time and break the upper part with a tip of a spoon or with your fingertips. Make sure your hands are clean when you are doing this. 2. Don’t break it too much, it won’t be nice. Break a small part of it. 3. Put a little stuffing into the small hole in the puri. 4. Dip the entire puri in the pani and eat it immediately. 5. Do like this for all the puris. 6. PANI PURI READY TO EAT!!!!!!!!! 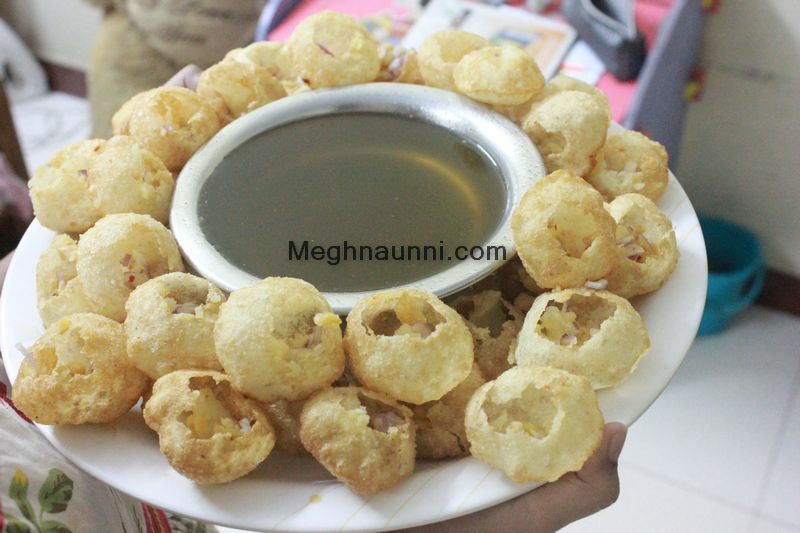 mouth watery paani puris….i just loved it my fav snacks….